November 19, 2012, 3:51 PM · Have you been secretly wishing to shed both your shoulder rest and chinrest? Here is your friendly, expert guide: Baroque violinist and Indiana University Professor Stanley Ritchie, in his new book, Before the Chinrest. For me, Professor Ritchie's book read like a novel, fully delivering on its cover's promise to reveal the "mysteries of pre-chinrest technique and style." It has that air of revelation, with each page putting a new historical spin on ideas I've taken for granted my entire musical life. Even if you (like I) have no intention of ditching your chinrest or shoulder rest, the combination of history, practicality and sheer love for Baroque music is both enlightening and inspiring. No skimming; I read it fully, with a pencil in hand, and left it full of marks and notes. Ritchie argues that he has gained a profound sense of freedom in going without the chinrest and shoulder rest. In fact, that sense of "freedom" is also what made him embrace the Early Music movement, which was just making its way from Europe to the United States when he discovered it in the 1970s through his colleague Albert Fuller, to whom his book is dedicated. Before he "went Baroque" (I couldn't resist), Ritchie was a successful "modern" violinist. Born in Australia, Ritchie graduated from the Sydney Conservatorium of Music in 1956. He then studied in Paris with Jean Fournier; then in the United States with Joseph Fuchs, Oscar Shumsky and Samuel Kissel. He went on to serve as concertmaster of the New York City Opera in 1963, then associate concertmaster of the Metropolitan Opera from 1965 to 1970. 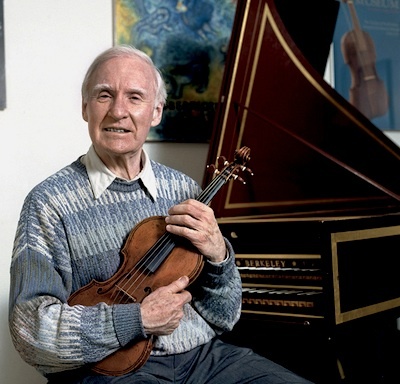 In 1970 he joined the New York Chamber Soloists, then in 1973 played as Assistant Concertmaster of the Vancouver Symphony until 1975, when he became first violinist in the Philadelphia String Quartet (in residence in the University of Washington in Seattle). He joined the Indiana University School of Music in 1982 as professor violin, and has served in that capacity ever since. Last month I spoke over the phone with Ritchie about how the Early Music Movement changed his life, about playing without a chinrest or shoulder rest, and about how his book clears up some misconceptions people might have about Period Performance. Laurie: What made you want to take up the violin in the first place? Stanley: I was born in New South Wales (Australia), in a farming community where there was no live music of any kind. My mother used to listen to the radio, so I was always listening to classical music -- even though it was canned. But she wanted me to have music lessons of some sort. When I was seven, my parents took me to the city for the first time, and as we were walking down the street in the city, I saw a violin in a shop window. I pointed at it and said, "I want that!" They discussed it and said, "Well, it's cheaper than a piano…" So that was it! I took violin lessons at the local convent, the only place to take violin lessons. I had eight years of ladies all but one of whom knew nothing about the violin at all! But why did I take up violin and make it my life? When I graduated from high school, I had a scholarship that would have taken me three years at a university, undergrad and everything. I stood on the grounds of the university with my mother, looking around me, tossing between going there, or to the Conservatorium to take music lessons. I chose the Conservatorium for two reasons: A, I was scared of the university, over-awed by the whole thing. And B, subconsciously, I think, to please my mother! That's how I became a violinist. (He chuckles) Not driven from the age of three to be the greatest violinist in the world! Laurie: How old were you when you started, then? Laurie: What made you fall for Baroque music? Stanley: I guess the seed, the germ of it, was planted by a question that always appeared in a written exam we had to take to graduate (from the Sydney Conservatorium of Music): "What is meant by 'style' in music?" And so we thought about it. Whatever we came up with, at least we began to think about it. Then I came to the United States several years later, in '59, to the School of Music at Yale. I thought about doing a master's degree, then decided it wasn't the kind of thing I wanted to do…But one course really got my attention, that was 'Performance Practice' -- a term that I'd never heard before. I took the course, which was taught by the late David Kraehenbuehl, who was a wonderful, wonderful professor. He really opened my eyes -- all of ours -- to the difference between certain things we took for granted in performance style, and what might have been the truth. Ten years later, after I'd finished my studies, and after I'd free-lanced in New York and played with the New York City Opera and the Met, I joined a chamber group called the New York Chamber Soloists. The harpsichordist was Albert Fuller, who had been teaching at Juilliard for 40 years. We were concertizing, and one day, on the way back from an out-of-town performance, I said, "Albert, I'd really like to know more about Baroque music, could we get together and read a sonata or two some time?" And Albert grabbed me and said, "When?" -- because nobody had ever asked him that before, no free-lance violinist in New York at the time would think such a thing. When we got together, he said, "Do you know what they're doing in Europe now? They're tuning their violins a down half-step down, they're putting on gut strings and they're playing with old bows." I said, "Why would they want to do that?" And he said, "Well, why don't you try it?" So I tried tuning my violin a half-step down. And there I was, using a modern bow on loose strings -- it was not the greatest fun I'd ever had. Still, he was very persuasive. I had an old Tyrolean violin in the closet that wasn't being used, and we found someone to convert it back to its original condition. And so, I finally had a Baroque instrument -- well, a little hybrid: it was late-17th century instrument, with classical fittings, and borrowed a Dodd bow from Jacques Francais and had Bill Salchowmake a copy. This was 1971. Laurie: Had you taken your chinrest off at this time? Stanley: Yes. I took it off. I had already managed without my shoulder rest, by putting some sponge or foam rubber or something on the back of the instrument. That gradually condensed over a period of six months. By the end of that time, I didn't need a shoulder rest any more. And then the idea of going without the chinrest came. I remember meeting Gustav Leonhardt after a year or two of playing Baroque. Of course I was still making a living playing modern violin, because you couldn't playing Baroque violin. He spotted the mark on my neck -- and he said, "Ahhh, you mustn't play with a chinrest!" Laurie: Do you still use a shoulder rest for modern playing? Stanley: I don't need it. When I'm playing modern violin I hardly even use the chinrest now. Laurie: There's a raging debate about shoulder rests that happens from time to time on Violinist.com. People get almost moralistic and crazy about it. Stanley: Not using either, all I can say is this: people use shoulder rests because they feel that they need it. But I had a student who is well over six feet tall, with a long neck, and who is now a very successful concertizing Baroque violinist. He doesn't use a chinrest or a shoulder rest, and what he does is quite amazing. So it must be possible for anybody to do it. As I say, I'm much shorter, I'm a good six to nine inches shorter than that man, and it's probably much more comfortable for me. It depends on the physique of the individual, and also someone's ability to relax: not hold onto the violin or shoulder rest as though it were a clutching blanket. A lot of people raise their shoulder under the instrument, they're so afraid of dropping it, which is exactly what one should not do. Laurie: It sounds like you have to change your technique to make it work properly. Stanley:…it's pointless, because the instrument is going to be clamped like a vice. The whole point of playing without the chinrest and keeping your shoulder down is so that the instrument can resonate like a bell, whereas if you raise your shoulder, you're clamping. As long as the instrument is in contact with the shoulder, there is a certain dampening effect. Laurie: People have all kinds of crazy ideas about the period performance movement. As a pioneer in this movement, what kinds of misconceptions would you like to clear up for people? Stanley: I, for one, am not a flag-waving evangelist about this. I do it because it feels much more natural to me, and I think that's what it should be about: trying to make music in the most natural way. After all, the period instrument and early instrument movement has reached all the way into the 20th century now: from before Mozart, all the way up to Wagner and Mahler. One of the misconceptions might be that it's very snobbish or elitist. I wouldn't doubt there are people who are that way, but as a movement, its purpose is far from just trying to be better than everybody, but ideally to find out for oneself how music was approached at the time it was written. Any music. All music. Then of course, there are all sorts of misconceptions such as: you mustn't vibrate when you play Early music. That is utter nonsense. Laurie: The kind of vibrato that you describe in the book sounds like a really subtle kind of vibrato, but it is vibrato. I guess we can just clear that up right here: Was vibrato used in Baroque music? Stanley: The misconception about vibrato is that you don't vibrate when you play Baroque music. This is only true in (Baroque) orchestral music, you don't do it in orchestral music. Nor should a cellist who is playing continuo vibrate, because it confuses the pitch, and it makes the music expressive in the wrong way. But on the other side, there's the idea that constant vibrato is the way to play. I don't know when this idea started -- well I have an idea, it was sometime in the '20s when it became more general practice. And that is demonstrably incorrect, stylistically. We have lots of evidence, not only from what Leopold Auer said, but others as well. Besides, in performing parts from the 19th century, you can find where they would vibrate -- it was like any other ornament. I always say to people, constant vibrato is similar to trilling all the time. If you trilled on every note, people would think you're crazy. If you vibrated all the time in the 17 and 1800's, people would think you were crazy! Laurie: So vibrato was more like an ornament. Stanley: Oh very much so. Laurie: Plenty of teachers tell their students: the more vibrato, the better. They tell them to develop a continuous vibrato -- maybe you need that for the Bruch? Stanley: One of my colleagues certainly insists on it! He doesn't like to hear the violin played without vibrato. And he's somebody I respect very highly. One person, one musician, we really don't see eye to eye on this subject. Laurie: What made you decide to write this book, to put it all down? Stanley: It started, actually, with the sets of exercises that are at the back of the book. I had developed those exercises over the years for teaching intonation, and one of my doctoral students decided to use Sibelius to write them out. So at first, I wrote some annotation and started to write a few things down about how to use the exercises -- then some ideas about intonation and left-hand technique. And I put it out, desk-published it, as something called "The Violinist's Lefthandbook." The next step was writing something for the right hand and exercises for the bow, and I called that "The Violinist's Righthandbook." Then a few years ago I had a sabbatical, holed up in a nice little village in Northern Italy, and set to work putting it all together and adding and introduction and a chapter or two on interpretation. Essentially, it's a distillation of my teaching methods. It's certainly the direction I've taken my students over the last 30 years. They've taught me; it's what I've learned from them that I've put down in this book. Laurie: I think people get very intimidated by all the rules of Baroque music. For me, even just thinking of the Treatise by Leopold Mozart is intimidating. People think: if I play Bach, I don't know what people will say about it, because I don't know if I'm going to follow the rules right. Stanley: That's one of the side-effects of the whole movement; there's much more interest about the way they played Bach. There's so much more information out there now, than there was when I was a student. If people are at all curious, at least questioning the things they've been taught, there's a lot to find out. Curiosity is what got me into Early Music. Laurie: It seems to me that it's possible to be pretty free, once you know some of this stuff. Stanley: Absolutely. It's liberating, that's one emotion I really experienced when I took up Baroque violin. After playing so many years professionally as a violinist, I found playing Baroque violin akin to driving a sportscar. I felt physically liberated, and then eventually as I became more used to it, expressively liberated. As for rules, I think we are saddled with at least as many rules in traditional classical upbringing. That's one nice thing about 17th-century music -- there is no tradition that you can feel you're breaking. Therefore, when we approach music that's new to us, music that is not handed down by the traditional classical establishment, we feel we can experiment, try different ways of interpreting. I always tell my students, the last thing in the world that I want you to do when you come out of here is be a clone of me. I want you to come out of here finding your own way, asking questions, and putting it all together for yourself. Too often, when I hear people playing, they seem bound to a tradition, to the way their teacher taught them, and lacking spontaneity. Laurie: Wasn't there a lot of improvisation in Baroque music, anyway? Stanley: Absolutely. But it's something that's not taught any longer, and sometimes people are even discouraged from doing it, in modern training, which is terrible. When I first started improvising, I was playing a Corelli Sonata using the 1713 edition's embellishments, which may or may not have been Corelli's. I tried those, and then, after a while, I thought, 'I don't like that one: I'm going to change it a little'; and, "There's nothing here: why shouldn't there be something similar?' And so on. But the art of improvising is not something that just happens -- it's learned, too. One of the greatest improvisers today is Robert Levin, the pianist, who improvises Mozart concerto cadenzas. He's not improvising in the sense of making it up from nothing. He's tried many things and has a storehouse of different possibilities. As he goes along, he chooses one from here, one from there, and so on, and puts them together. Jazz players' improvisation is a learned skill. They're not just doing it off the top of their head. I sat in for a couple sessions of Dave Baker's jazz improvisation course, and it was amazing -- it's just very complicated. He's a wonderful teacher, but it was much too fast for me! There were books on how to improvise, certainly, from the end of the 16th to the beginning of the 17th century, showing you how to get from one note to another, and how many different ways, on one page, you can go, say, from E to F: about 20 different ways to get there. Laurie: So they were certainly doing it 400 years ago. Stanley: Oh my gosh, yes! Laurie: I think we have a misconception about that as well! Stanley: Sometimes we feel as though we know everything because it's the 21st century. I suggest we've forgotten an awful lot! For example, the 18th century people could teach us quite a lot about intonation. When you open Francesco Geminiani's 'Art of Playing on the Violin,', the second thing he does, after the first page, is chromatic scales! We're raised, as modern players, on equal temperament, and on so-called 'expressive' intonation. But, as Geminiani demonstrates, when you play pure intervals, you realize that F-sharp is actually lower than G-flat. A-flat is higher than G-sharp. I talk about this in my book. You can really figure it out pretty easily by using pure intervals. We have to use pure intervals on the violin. However, to do so, we must play on strings tuned in narrow fifths, we have to. So people are confused because, using 'expressive intonation,' you're taught to push sharps up and pull flats down -- this is what I call horizontal intonation. But when playing in a string quartet or orchestra, this kind of intonation doesn't work. One has to use pure intervals, or vertical intonation, in order to be in tune with other players. Every interval's out of tune on the piano except the octave: as string players we don't have to play that way. Anyway, the overall misconception that I'm talking about is the idea that people back then didn't know as much as we do. Laurie: Baroque music can even be kind of dissonant, with some really interesting harmonies. Stanley: Oh yes, tremendously. Musicians at that time were much more aware of dissonance and consonance and their significance than we are today. Laurie: In the book, you say that there is no such thing as unaccompanied music. Stanley: Well absolutely. When you are playing unaccompanied music, you are your own accompanist, and so you're playing the bass-line. In other words, you can extract the bass-line from any unaccompanied piece. This is relevant when we talk about breaking chords, as I do in the book. In the book I talk about different ways players break chords. When you are playing unaccompanied music, you are your own accompanist, and so you're playing the bass-line. If you break the chords before the beat, then the bass note comes before the beat. But the bass IS the beat! How would you feel if your accompanist on the piano were a little bit ahead of you all the time? Laurie: It sort of puts you out at sea, rhythmically. Stanley: And when you place the bass note on the beat, it actually makes a chord easier to play: you don't have to rush to get the other notes. Laurie: The sense of time is a fascinating thing in the Bach unaccompanied. People forget, you're not on the metronome, you're not on the clock. Laurie:…or Fritz Kreisler or something. Stanley: One of the things we lost, we've forgotten in our training, is that it's not only possible and desirable, to be free in this way, but it's also a type of expression. Rubato is a way of making the music more flexible and more natural. One of the important things that the Early Music movement has done is to raise awareness of the rhetoric, the declamation, and the affect, or emotional message, of each piece -- and each part of each piece. For example, let's take Bach. When you're playing the unaccompanied pieces from the original, or from an urtext, there are no expression marks -- none is written in. But they're really all there: in the harmony. Yes, there's rubato; yes, there's punctuation; yes, there's hesitation. They're all there, if you are aware of the significance of the harmonies: where something finishes, where something starts. There are places in Bach that are ambiguous, too, which you could read one way or the other. That's the nice thing about much of his music: you don't have to play it the same way twice. November 20, 2012 at 12:18 PM · What a great interview! I play baroque violin (among many styles) and use a baroque violin with no shoulder rest of chin rest. I love it! I find that for the baroque style of music that it is perfect! I do, however, continue to use my shoulder rest and chin rest for playing modern music and fiddle music. I also love the fact of vibrato as an ornament! That is the way that I like to use vibrato, and I am often criticized in my modern playing for not using continuous vibrato. For me it is a personal preference that I like the sound of vibrato when it is used sparingly. November 20, 2012 at 04:00 PM · Yes! November 20, 2012 at 04:30 PM · Great interview with a very interesting musician. November 21, 2012 at 06:06 AM · Good timing--NPR just ran an interview with John Eliot Gardiner that discussed his Baroque orchestra playing Beethoven's 5th. He had some interesting things to say about baroque instruments and style that don't contradict Ritchie. And I must say, I enjoyed the "fresh" take on the 5th. Thanks. November 21, 2012 at 06:52 AM · What a great interview, thank you to Laurie for good questioning, and also to Mr Ritchie for giving such informative responses. Its sent me off to youtube (where else! ), and his mozart and Corelli are lovely. Watching him play, there's no artifice, not tension or unnecessary movement, just pure playing. November 21, 2012 at 03:57 PM · What a great interview! I had the pleasure of meeting Professor Ritchie last summer when I was attending a period performance workshop at IU with my trio. He gave a fantastic coaching and was happy to talk shop with me and even let me borrow some baroque bows for the week I was there. A great musician and teacher! Needless to say, I'll be getting his new book. November 21, 2012 at 04:05 PM · Thank you for doing the interview, Laurie. It is very interesting to hear his viewpoint. The points about vibrato are especially interesting. I would say further that the practices of baroque players in that time are maybe more connected to 20th century violinists than we think. Geminiani and others advocated vibrating whenever possible, outlining different types of vibratos and the idea of keeping the hand alive. Other big names advocated the opposite, and vibrato as an ornament rather than a 'state'. Needless to say that both, when done convincingly, are as beautiful as the other. I can point to the bach recordings of Gordan Nikolic, a more period style interpretation, which i truly love, and also to Henryk Szeryng, who is often on the other side of the spectrum. It is different but equally beautiful. I think one must just do what is most beautiful to them, not what their teacher or someone has told them. If one has the experience in various settings, and is at a high level, it is simply a matter of believe in what they are doing, being aware. One must be able to convince the audience aurally and ready to convince verbally in conversation, to show why something is beautiful to them, and why they believe there is no other way! I admire when an artist can have this ego, but not in a condescending way towards other options, but just out of love for what they believe in. This is what art is all about! There is a wonderful masterclass by Gyorgy Sebok from the 80's. In one part he describes the differences between playing Bach, Mozart/haydn, chopin - how the artist should approach these works differently, without seeming like a sociopath that is just trying to show how "different" he can play. in this first of 6 wonderful segments, he addresses this idea. November 21, 2012 at 05:39 PM · I just orderd the book. I'm certainly not going to go without a chin or shoulder rest, but I'm very interested about the history of violin technique (I love Boyden's book!). I'm looking forward to diving into this volume. November 22, 2012 at 05:21 AM · Really cool! Mr. Ritchie's picture is also super epic! November 23, 2012 at 12:28 AM · Those Sebok videos are some of the best things on YouTube. Nice to see them mentioned here! Mr. Ritchie taught me baroque viola for 9 happy months. I walked into a lesson one day, and said..."I just cannot figure out how to hold this thing!". He said, "Here's an image for you...the viola is filled with helium and wants to float away. The bow holds it back from floating to the ceiling." I return to that image again and again when experiencing trouble, and was so heartened to see him mention it in his book. Stanley is a great man and a great teacher. November 25, 2012 at 09:03 PM · Fine, yes, yes but: In order to maintain the baroque spirit throughout, let's be sure that no microphones or any electronic amplification is ever used at these baroque performances....otherwise the whole shtick is moot..and certainly no conductor...and perhaps a hankie to protect the finish is also verboten ?? ?